Hi friends I have happy news I am guest design team for the Craft Cupboard Trilogy. Challenge # 4 is Things with wings. It would be great if you could join in our challenge. The second best ever news I have been asked to stay on the design team. I guess I better pull my finger out and get blogging a bit more. wow lyn that's stunning i love butterflies . 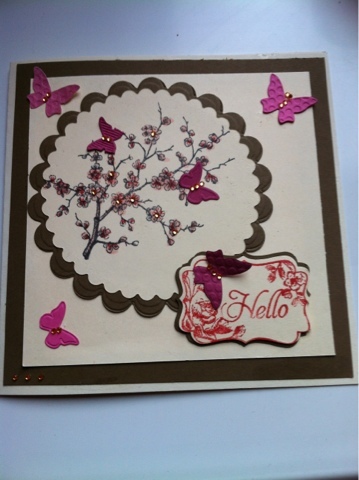 Lovely card Lyn and congrats on making the DT - well deserved!! Hello Hun, I hope you are keeping well. Congratulations on your guest design team spot. Your card is gorgeous. I love the beautiful colours and the butterflies. What a lovely card. Superb design. Like the colors and that butterflies are so cute. I appreciate it.